Located in the Methow Valley, just outside of Twisp sits ‘Twisp Cabin’. This project was in collaboration with Chris Thomas who is one half of Thomas Fragnoli - a local Seattle General Contractor, and the owner of the cabin. The cabin is located in an area known for its year round outdoor activities, the cabin would serve as an outpost for Chris and his wife to entertain and enjoy the outdoor. Chris approached us to consult on the project just as it was beginning on site. With the big picture moves for the project laid out by the owner, we were involved in finessing the design details, materiality and interior/exterior layout and finishes. A material palette was refined using dark stained horizontal wood siding contrasting with a warm inviting interior and natural wood soffit and exposed roof structure. The large overhanging shed roof deals well with the heavy snow load during the winter months where the area experiences several feet of snow. Through our design process of digital 3D modeling and renders we were able to work quickly to finalize the exterior envelope and detailing as the project was going up on site. 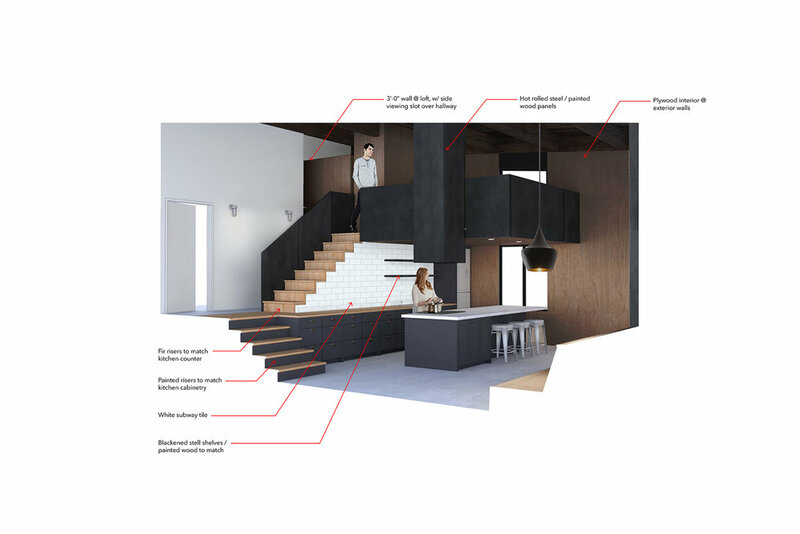 Similarly, with the interior of the main living space we were able to come up with creative solutions to maximize the use of space and explore different material options and finishes. Working closely with an owner who has many years of experience in the construction industry and a hands on approach to problem solving has been a great collaborative process.